Tayinloan Village By the time you reach Tayinloan you will have travelled some 20 miles south into the Kintyre peninsula. 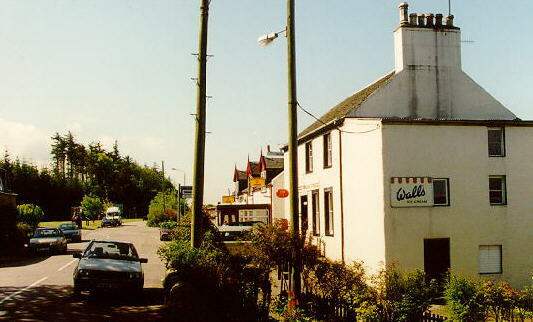 The village has had a by-pass in place for many years now so you won't actually drive through it unless you turn off the main road deliberately, which you'll have to do if you want to take the ferry to Gigha. The view to the left shows the village as it would have appeared to the south bound traveller in the days before the bypass. 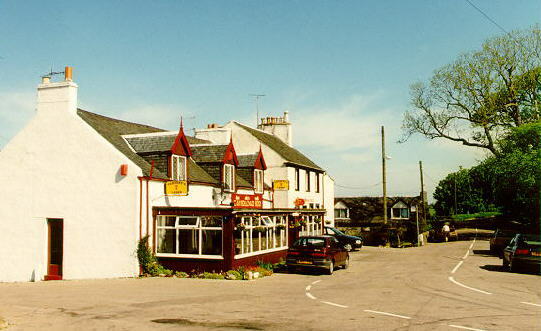 The village shop is the foremost building, the hotel beyond that, and hidden further along is the village hall. From the road Tayinloan looks like a very small village but it is a lot deeper than it first appears, just look back when travelling on to Campbeltown. This picture shows the ferry crossing across from Kintyre to the island of Gigha which can be seen faintly in the background. The crossing, which takes about half an hour, is operated by Caledonian McBrayne and operates all year round. Gigha is famous for it's gardens which are a product of it's unusually temperate climate. It catches the Gulf Stream even more than Kintyre and as a result the growing season usually starts a few weeks earlier than on the mainland. Throughout the Southern part of Kintyre you can see palm trees, not normally a native of the Scottish mainland, but able to grow here because of this unusually warm climate, although most days you wouldn't have noticed it! A few miles south of Tayinloan you pass briefly through the village and estate of Killean. My MacKinnon grandparents are buried in the small cemetery just across the road from the buildings shown here. 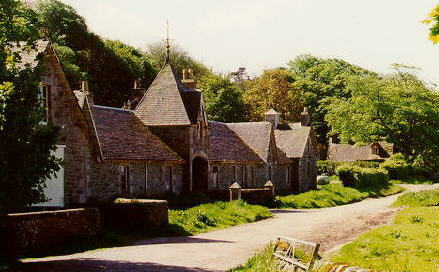 These buildings are part of Killean Estate. Just prior to the point of this picture there are a number of quaint, old houses built in a very untypical style for this part of the world, known as the "doll's houses". Built by a previous owner of the estate they're now available for holiday rental. Keep on heading south and you come to my favourite beach in the whole of Kintyre - Westport. In a picture like that shown it's completely at peace with the world, but on a stormy day with the breakers coming all the way across from America it can be incredibly wild, shouting and roaring and swearing away at you! I'm led to believe that this is one of the few stretches of mainland coastline in Scotland with a completely uninterrupted run across the Atlantic to the U.S., as a result the waves are pretty wild at times. This stretch of sand runs some five miles, all the way around the coast from Westport to Machrihanish. It's not a beach for swimming although, it has some strong undercurrents which have claimed a number of lives in the past, however it is popular with the surfing community.